Why Should You Freeze Scrambled Eggs? How Long Should You Keep Scrambled Eggs Frozen? Here’s a quick and short answer: Yes. However (yes, there’s a however), freezing scrambled eggs is not as simple as it sounds. If you want to enjoy your reheated scrambled eggs, you should know how to prepare it properly (for freezing) and how to store it well. Otherwise, you might end up with an edible-but-rubbery reheated scrambled eggs that you can’t even appreciate. 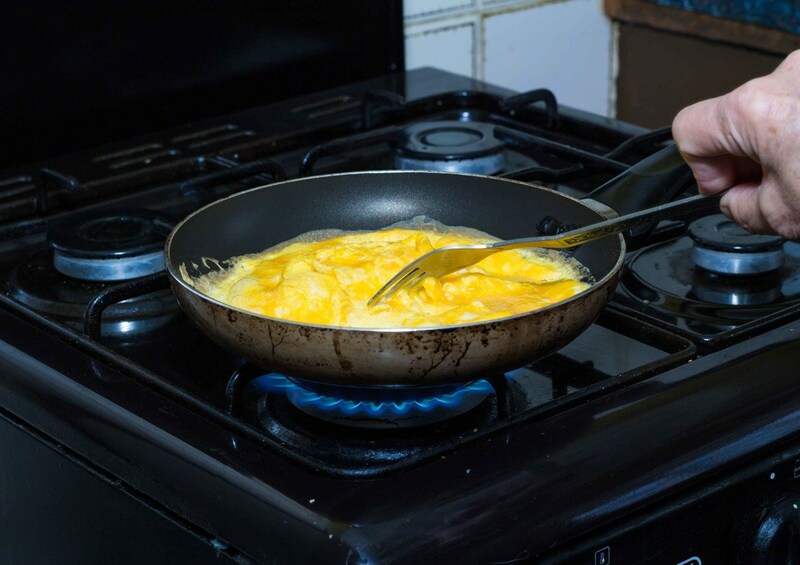 When cooking the scrambled eggs, aim to have a runny texture instead of a firm one. If it’s well done, the texture will be rubbery when you thaw it and reheat it. On the other hand, reheating frozen scrambled eggs with runny texture will result in a soft dish that tastes as fresh (or almost as fresh) as newly cooked scrambled eggs. 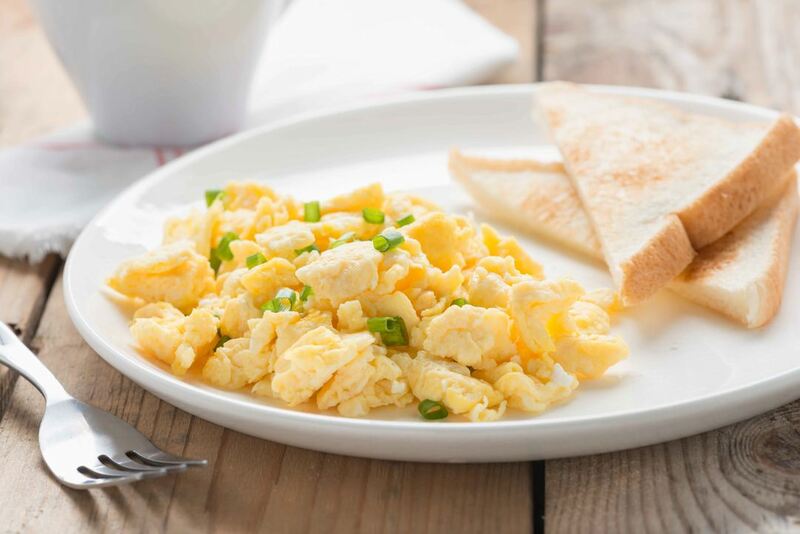 Allow freshly cooked scrambled eggs to cool of completely before storing them in the freezer. If you skip this step, the dish won’t have a good texture when reheated. It’s advisable to store scrambled eggs in small portions of single-serve sizes for easy reheating. When stored in uniform sizes, you can just take out a pack as needed. For best results, use a clingwrap plastic (Amazon) to store scrambled eggs. With this type of wrapping, you can squeeze out excess air from the package and prevent freezer burn. Put a label on the wrapped/ stored scrambled eggs. This method is especially useful if you’ve frozen more than a batch of scrambled eggs at a time. In this case, it would be necessary to use those portions that were frozen first than the newly frozen batch as they will spoil (or go bad) first. Aside from the many possible reasons for wanting to freeze scrambled eggs, your main purpose for doing this is to prolong its life. Yes, while cooked scrambled eggs will stay fresh in the refrigerator for a few days, it can last for several months in the freezer. When cooked and stored properly in the freezer, scrambled eggs can last up to a year when frozen. But really, it shouldn’t take that long to consume frozen scrambled eggs as it’s a waste of freezer space. Therefore, I would suggest consuming frozen (cooked) scrambled eggs within 3 to 6 months of freezing them. If you’re planning on eating scrambled eggs the next day, you can place the frozen portion that you need in the refrigerator. It will thaw overnight and will be ready for reheating the next day. 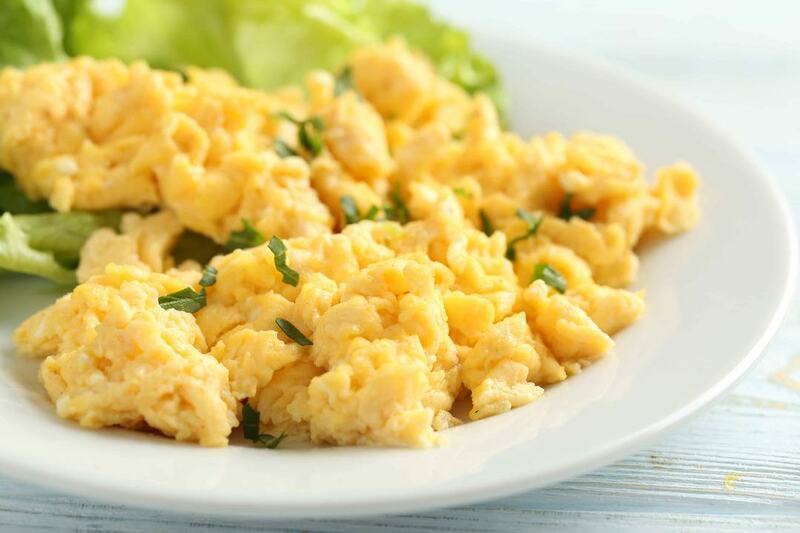 You can thaw frozen scrambled eggs in an instant (instead of overnight) by using a microwave. If your microwave has a thaw function, just press the button and your frozen scrambled eggs will be thawed instantly. It will then be ready for reheating. Put some butter into the pan and allow it to melt and heat up slightly. Add the thawed scrambled eggs in the pan and proceed to reheat it. Stir the mixture constantly for the heat to spread evenly. Wrap the thawed scrambled eggs in tin foil before putting inside the oven. Reheat the food at 300 degrees Fahrenheit for about 20 minutes. Check if the egg is already heated through. Add a few more minutes if it’s still not hot enough. Now, hear me out. While it’s reasonable to want to freeze scrambled eggs to save on time in cooking them fresh, there is actually a way to make quick scrambled eggs. So quick, in fact, that it’s not as troublesome as cooking this dish the old-fashioned way (on the stovetop). Get a bowl or mug to scramble the eggs in. Add a liquid ingredient to the mixture (milk or water). If you want to add other ingredients to the scrambled egg recipe (cheese, vegetables, etc. ), you can do so in this step. Cook the scrambled eggs in the microwave (at high setting) for about 1 to 2 minutes (or until done). As you can already tell, the steps to making scrambled eggs in the microwave (video) is fast and simple. 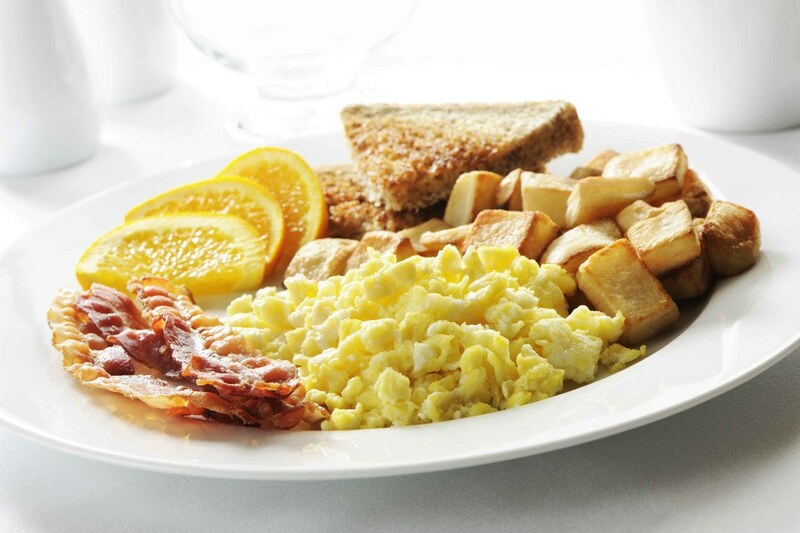 Eggs cook really fast in high heat – that’s why cooking it in the microwave is a good idea. Sure, this technique takes some time, but you don’t even need to use a cooking pan to do it (less dishes to wash). 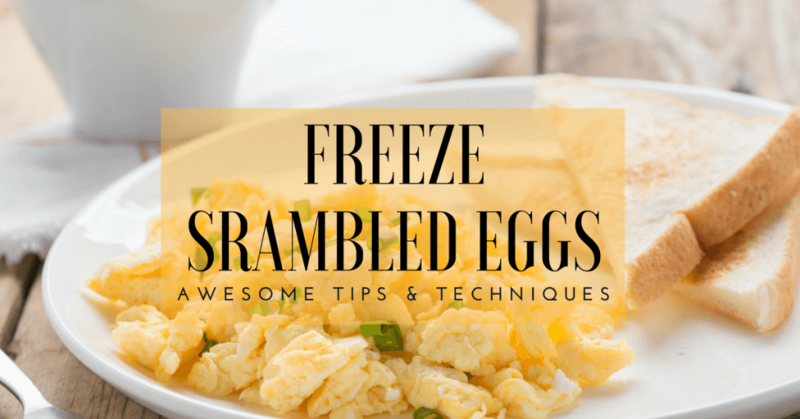 This method also eliminates the methods of freezing, thawing, and reheating scrambled eggs (which also takes some degree of time and effort). Still on the subject of freezing scrambled eggs, this section is about freezing uncooked scrambled eggs. See, I’m just providing you with a lot of options when storing, preparing, and eating this dish (like I said, it’s one of my favorite foods). So anyway, just follow these steps. Get a bowl and scramble your desired number of eggs. Add seasoning (either sugar or salt) to the mixture. This is an important step when freezing raw scrambled eggs as these will keep the moisture in the mixture. Otherwise, cooking the raw eggs (once thawed) will result in a gel-like consistency (not good). Store the raw scrambled eggs in a Ziploc bag and remove excess air. Seal tightly. Put the Ziploc bags with scrambled eggs in the freezer. I suggest storing small portions of raw scrambled eggs per pack so that you can thaw and reheat by batch when needed. Label the Ziploc bags with dates as to when you prepared the eggs. Don’t put whole eggs (with shells) in the freezer. Break the shells to properly freeze the yolk and egg whites.Unless you’re making scrambled eggs, egg whites and egg yolks should be frozen separately. To freeze egg whites, pour the mixture into an ice cube tray to make them form into blocks. When frozen, remove them from the mold and transfer them to freezer-safe containers. Egg yolks will turn into gel-like consistency when frozen and thawed. To avoid this undesirable texture, add 1/8 teaspoon of salt to ¼ cup of beaten egg yolks (about 4 to 5 yolks). You can also use sugar instead of salt. For sugar, add 1 ½ teaspoon for ¼ cup of yolks. When labeling frozen egg yolks, it would be best to label the container (or bag) with the following information: (Date; Number of egg yolks). 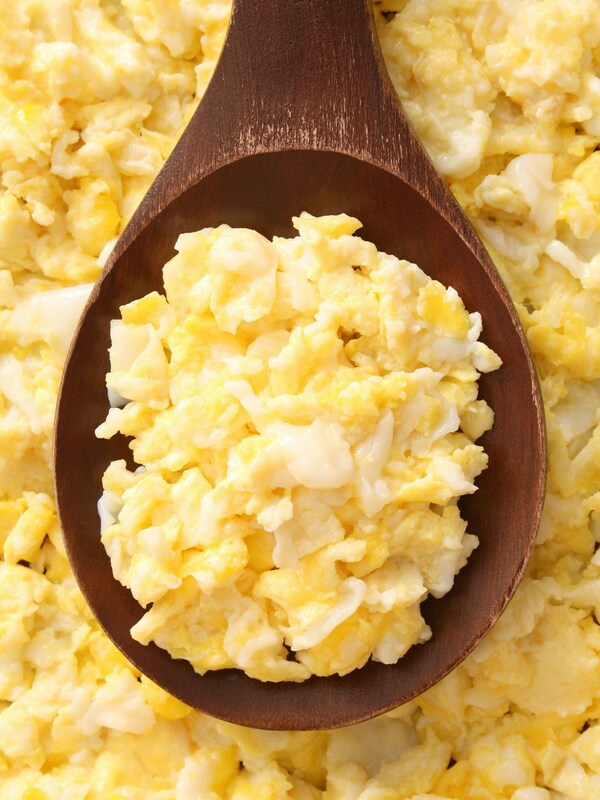 For scrambled eggs, you can beat the egg whites and egg yolks together before freezing the mixture. When it’s already well-blended, transfer the mixture to freezer safe bags (in small portions), remove excess air, and seal. Don’t forget to label the packages with dates. You can cook egg yolks in boiling water before freezing them (yes, just the yolks). This technique will preserve the quality and texture of the hard-boiled yolks even when frozen – they will neither be tough or watery. Do not re-freeze thawed frozen eggs (whether cooked or uncooked). For the best quality eggs, eat them as soon as they’re cooked. Do not overcook eggs as this will greatly affect their texture. For even reheating, freeze cooked scrambled eggs in patty form. Reheat frozen eggs as soon as they’re thawed. Egg is a very nutritious food – and it’s high in protein. Scrambled eggs are particularly versatile, as you can add other ingredients to it to make it even more nutritious (and interesting). This style of cooking eggs is also easy as you don’t even need to have an unbroken yolk to make it. 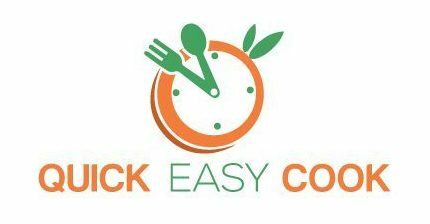 So, there – now you can enjoy making scrambled eggs on the spot or quickly by freezing egg recipes already cooked in advance. Do share this post with your friends to let them know how much you enjoyed it. I would also love to hear from you (the comment section is located below this article).